Several groups of students representing the Maryland Robotics Center within the A. James Clark School of Engineering participated in demonstrations of robotics projects during National Robotics Week. The events, which took place at the Smithsonian Institute the week of April 9-17, brought together students from universities across the country to showcase research in unmanned aerial vehicles, micro aerial vehicles, and unmanned ground vehicles. Two groups of Maryland students showcased technology they are developing for ornithopters, bird-like micro air vehicles (MAVs) that have flapping wings. This biologically inspired design is quieter than a propeller-driven vehicle, making it useful for military reconnaissance. A group of students from the Morpheus Lab showcased an ornithopter control system that is being developed for military operations. Donated by lab director and Langley Distinguished Professor of Aerospace Engineering Jim Hubbard, (AE) it is the latest in a series of prototypes of a bird-like micro air vehicle (MAV) that have become increasingly intricate. Initial tests have been conducted with MAVs that had flapping wings modeled after those of birds. With these robots, weight is always a key concern. Thanks to a lightweight drive mechanism developed by Maryland Robotics Center Director and Professor S.K. Gupta (ME/ISR), researchers have developed a prototype with wings that fold as well as flap. Throughout the day on April 15th, visitors to the National Air and Space Museum were treated to demonstrations of the MAV by a team of Maryland undergraduates. David Matten, a research assistant working on the project, estimated that approximately 500 visitors, mostly K-12 students, witnessed the demonstrations. Assistant Professor Sarah Bergbreiter (ME/ISR) and Maryland student Wayne Churamon also participated in the demonstrations at the Spark!Lab. They showed off their jumping microrobots, which have the potential ability to jump over obstacles or latch onto larger moving objects. 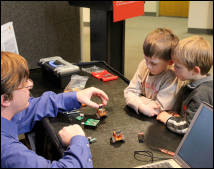 Visitors viewed the microrobots under microscopes while videos showed the robots in action. According to Spark!Lab personnel, approximately 2,000-3,000 visitors viewed the exhibition. Associate Professor Pamela Abshire (ECE/ISR) and her student Michael Kuhlman presented a demonstration based on research in the Integrated Biomorphic Information Systems Laboratory (IBIS Lab) at the Koshland Science Museum on April 16, 2011. Over the course of the day about 75 members of the public attended presentations and played with the demonstration. These demonstrations were just a few of more than 100 events that took place across the country during the second annual National Robotics Week.